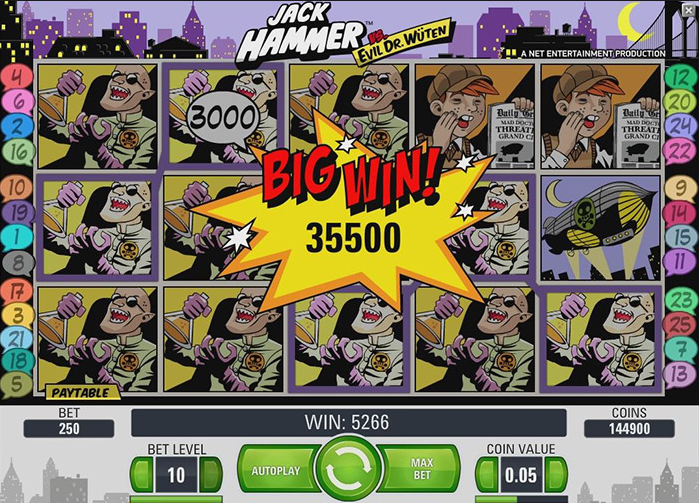 This Net Entertainment slot is based on an old school comic book known as Jack Hammer. Jack is a private eye detective that is out to fight crime. 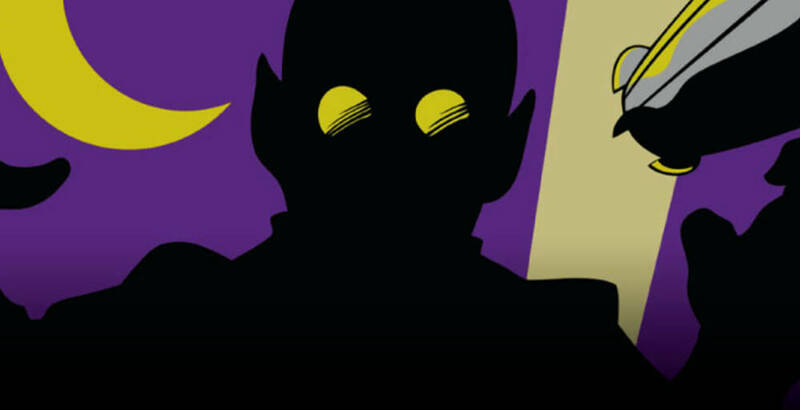 His main rival is the super villain known as Dr.Wüten who is always out to cause mayhem in the society. Various features and gadgets are added to totally annihilate his evilness. If you read comic books when young or you just loved storytelling, this game should be right up your alley. The game has three rows, 25 paylines and 15 reels that roll independently. The symbols that feature in this game are all themed along the same line as the story and are reminiscent of the 1920’s, the time period of this slot. Symbols include Dr.Wüten himself, gangsters with guns, beautiful ladies and rather eerily ringing phones. All of this is surrounded in a cartoon style game with a suitable storyline to match. 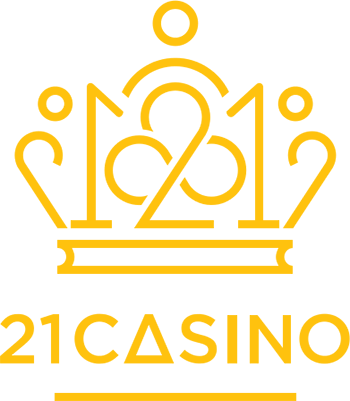 Expert analysis suggests that this game has a 97% payout, which creates a very decent player returns that should encourage players to join the fun. Unfortunately you can never have an infinite number of win lines. For Jack Hammer you only have an option of 25 lines of these. Bet level refers to the number of coins you can bet in a line. You therefore can adjust the number and value of the coins that you place in a specific line. 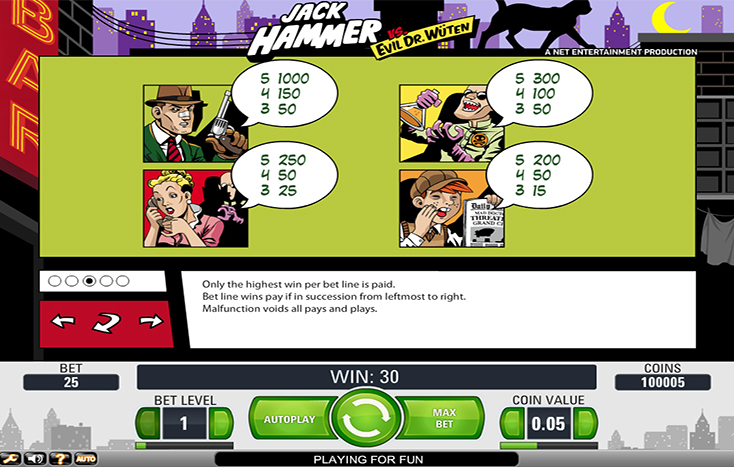 Jack Hammer offers a player coin values from 0.01 to 2 Coins and you can only play between one and ten coins per line. 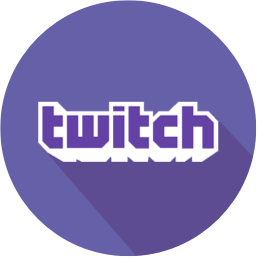 That means for this game the minimum bet goes for €0.25 and a maximum of €500. If this sounds a little bit complicated there is no need to worry. There is a help button on the bottom left which is known as the ‘pay-table’ button. 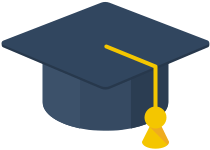 It helps the player by calculating any combinations so that they can make informed decisions before playing a game. As with all slot games there are some excellent bonus features to enjoy. The Wild symbol, represented by an explosion and the word ‘wild’ serve the purpose of completing any combination to form a win. This is with the exception of a free spin. The Wild symbol replaces other winning symbols therefore it increases the chances of a player to win. The Free spin symbol is a ticking bomb. 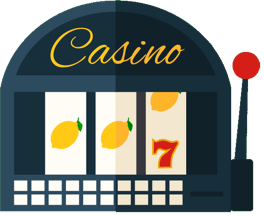 To win the free spins bonus, a player has to land a minimum of three of the free spin icons on the reels. Once this round is in effect, a player can win some substantial rewards. The overall winnings are a maximum of 30 free spins and a minimum of 10. The free spins increase in multiples of five and these depend on the number of Scatter symbols acquired previously. 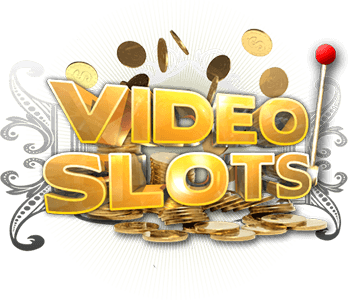 For example, five wins ten free spins, seven wins 20 and more than nine wins thirty spins. 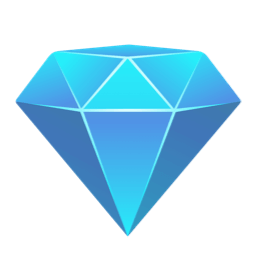 When a player gets the free spins, they can get some extra free spins if they happen to get three or more free spin symbols. All the free spin wins in a game will be multiplied by three. The sticky wins symbols are the killer features on this game. Just as the name suggests, when a winning combination is achieved, the reels will stick while the other symbols continue to roll. This gives the player more winning options. When no more possible combinations can be achieved, the game will resume to the normal game play. The sticky win symbols can also be activated when the three or more free spin symbols are achieved. You can adjust the game settings the way you want in order to increase the excitement of the game. At the bottom left there are settings icons that can be used to make these adjustments. First of all you can adjust the sounds and by increasing or just turning them off. The game offers the option of playing some games automatically without having to intervene manually. You can set the actual number of spins you want to be automatic in a particular game. 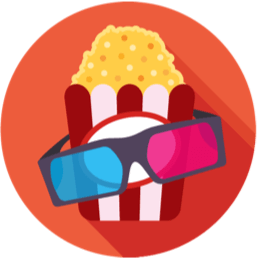 Another icon allows the player to view the history of the game and adjust the ambience of the game. The game is played by using the buttons on the bottom of the screen. There is a large button in the middle spins the reels in a manual play. You can interchange manual and automatic games at free will. There are also the ‘max bet’ and ‘coin’ value buttons that are set for placing the amount of coins and level of play respectively. To stop a spin during the manual play, you press the middle button again. Jack Hammer has successfully made the transition to a mobile slot in the form of Jack Hammer Touch. As hoped, this game made looks excellent on the small screen and the graphics and ambience of the game lose none of their charm. Available on all devices from iPhones to Android, the simple graphics almost looker better on the small screen. With such a successful change over, Jack Hammer is now available to more people and at any time, thus continuing and in fact increasing the popularity of Jack Hammer. Overall, Jack Hammer is an excellent and highly addictive game. With its neat and fun animations, interesting story and exciting characters, Jack Hammer keeps players coming back for more. The excellent sticky wins bonus feature is of course a huge draw card and has high levels of tantalizing times to win big. This is one game that should never be forgotten or cast aside.